« Four page spread on Sacred Skin in Courrier International! 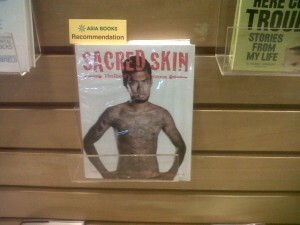 Sacred Skin is an Asia Books Bestseller! My new book, Sacred Skin, the first English language publication on Thailand´s popular sacred tattoos, is a recommended bestseller in Asia Books, Thailand´s premier English language book chain. And Asia Books have just placed another huge order with Sacred Skin publisher Visionary World.